It seems as if there’s no way to escape Christmas; the sleigh bells are jingling, the cries of “it’s behind you” are ringing out in theatres up and down the land and the cry “it’s Christmaaaaaaas” is assaulting your ears from every shop speaker. For theatre-goers looking for an escape there are few opportunities, but Graeme Dallas’ one (wo)man show Miss Demeanour offers a cheeky and sometimes thought-provoking alternative to the usual festive fodder. 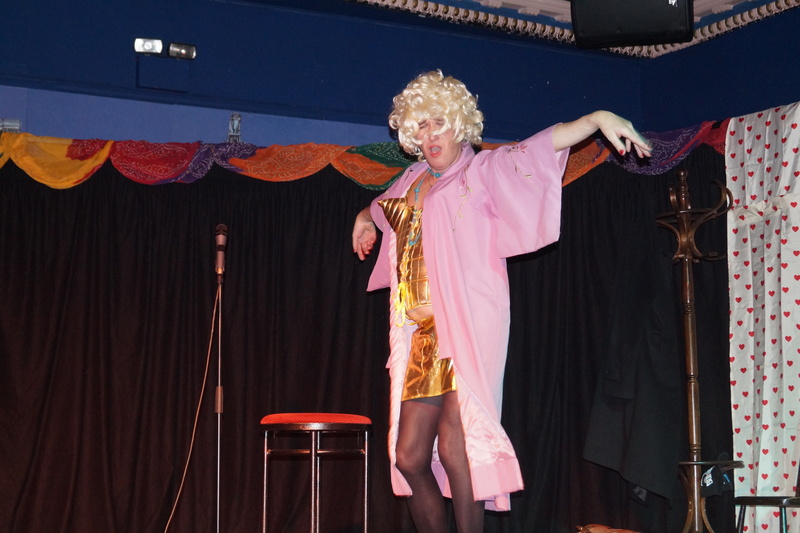 The tale of a down on her luck drag queen about to give her last performance before jetting off to the sunshine and a new life, is in turn laugh out loud funny and heart-breakingly tragic. Charting the less than glamorous ups and downs of a life lived in the (somewhat dim) spotlight: less than flattering costumes; a shocking blonde fright wig; criminal lip-synching and some truly dodgy dialogue, from the outset it isn’t hard to see why Miss Demeanour is down on her luck. As we scratch the surface all is not what it seems, behind the sparkle our heroine is desperate to escape with her partner to a life in the sun, but as the story unfolds an inevitable aura of tragedy hangs high in the air. The play is tear-inducingly funny in parts, the Madonna scene is a highlight and Dallas handles the more dramatic parts with aplomb. Where the piece falls down is in a bit of polish. The linking dialogue and audience patter needs a bit more work to make it flow better and the drama could be ramped up even more to provide even greater contrast. That said, the mascara was running down this reviewers face at times and the show thought-provokingly hit the mark at others. With a little bit of work this could be a real gem.